Aperture is perhaps the single most important camera setting that every photographer needs to know. Whether you do landscape photography, portrait photography, or anything in between, you have to set your aperture properly in order to capture successful photos. Below, I’ll dive some important terminology — aperture, f-stop, and f-number — and talk about how to use them for your own photography. Aperture is basically a hole in your camera’s lens that lets light pass through. It’s not a particularly complicated topic, but it helps to have a good mental concept of aperture blades in the first place. These blades form a small hole, almost circular in shape — your aperture. They also can open and close, changing the size of the aperture. That is an important concept! Often, you’ll hear other photographers talking about large versus small apertures. They’ll tell you to “stop down” (close) or “open up” (widen) the aperture blades for a particular photo. As you would expect, there are differences between photos taken with a large aperture versus photos taken with a small aperture. I’ll cover those in a moment. For now, just be sure that you can picture the aperture blades in a lens opening and closing, and you’ll be good. 2) What does aperture do? Aperture is one of the two components of exposure (along with shutter speed). That means it affects the amount of light that reaches your camera sensor. This should make sense. Aperture is a lot like the pupils in your eyes. It changes how much light you capture. As you can see, a large aperture captures more light than a smaller one. However, that isn’t the only thing that aperture changes. When you change the size of the aperture, f-stop is simply the number that your camera shows you. It is also known as an f-number. You might have seen this in your camera before. On your camera’s LCD screen or viewfinder, the f-stop looks like this: f/1.8, f/3.5, f/5.6, f/8, f/16, and so on. Sometimes, it will simply be shown like this: f1.8, f3.5, f5.6, f8, f16, and so on. Aperture is labeled in f-numbers. In this case, I’m using an aperture of f/8. 4) Why is aperture written as an f-number? Why is your aperture written like that? What does something like “f/8” even mean? Actually, this is one of the most important parts about aperture: It’s written as a fraction. You can think of an aperture of f/8 as the fraction one-eighth. An aperture of f/2 is equivalent to one-half. An aperture of f/16 is like one-sixteenth. Hopefully, you know how fractions work. 1/2 cup of sugar is much more than 1/16 cup of sugar. A 1/4 pound burger is larger than a 1/10 pound slider. By that same logic, an aperture of f/2 is much larger than an aperture of f/16. An aperture of f/4 is larger than an aperture of f/10. If you ever read an article online that ignores this simple fact, you’ll be very confused. Pop quiz: Which aperture is larger — f/8 or f/22? You already know the answer to this question, because aperture is a fraction. Clearly, 1/8 is larger than 1/22. So, f/8 is the larger aperture. If someone tells you to use a large aperture, they’re recommending an f-stop like f/1.4, f/2, or f/2.8. 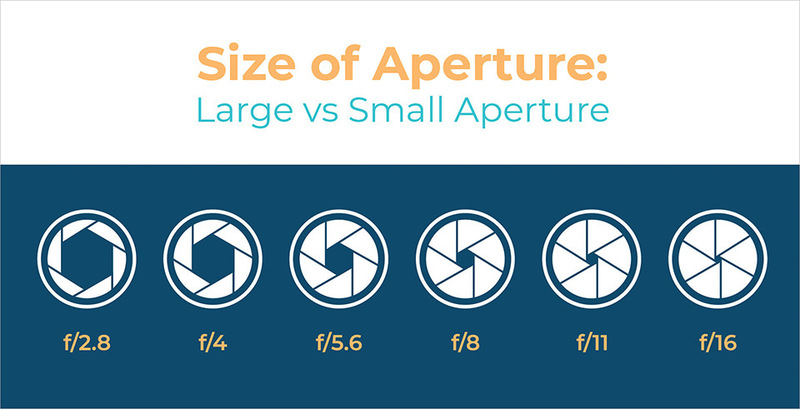 If someone tells you to use a small aperture, they’re recommending an f-stop like f/11, f/16, or f/22. As you can see, an f-stop like f/2.8 represents a much larger aperture opening than something like f/16. 5) What does the “f” stand for? A lot of photographers ask me an interesting question: What does the “f” stand for in f-stop, or in the name of your aperture (like f/8)? For example, say that you have an 18-50mm lens zoomed to 50mm. If your f-stop is set to f/10, the diameter of the aperture blades in your lens will look exactly 50mm/10 = five millimeters across. This is a cool concept. It also makes it easy to visualize why an aperture of f/2 would be larger than an aperture of f/10. Physically, at f/2, your aperture blades are open much wider. 6) Which f-stop values can you actually set? Unfortunately, you can’t just set any f-stop value that you want. At some point, the aperture blades in your lens won’t be able to close any smaller, or they won’t be able to open any wider. Typically, a lens’s largest aperture — wide-open aperture blades — will be something like f/1.4, f/1.8, f/2, f/2.8, f/3.5, f/4, or f/5.6. A lot of photographers really care about the largest aperture (aka “maximum aperture”) that their lenses offer. Sometimes, they’ll pay hundreds of extra dollars just to buy a lens with a maximum aperture of f/2.8 rather than f/4, or f/1.4 rather than f/1.8. Why is a large aperture so important? I’ll cover that in the next section. However, since people care so much about maximum aperture, camera manufacturers decided to include that number in the name of the lens. For example, one of my favorite lenses is the Nikon 20mm f/1.8. The largest aperture it offers is f/1.8. I took this photo at f/1.8 with the Nikon 20mm f/1.8 lens. The only lighting in this shot is the moon. With a large aperture (and a tripod) you can practically see in the dark. 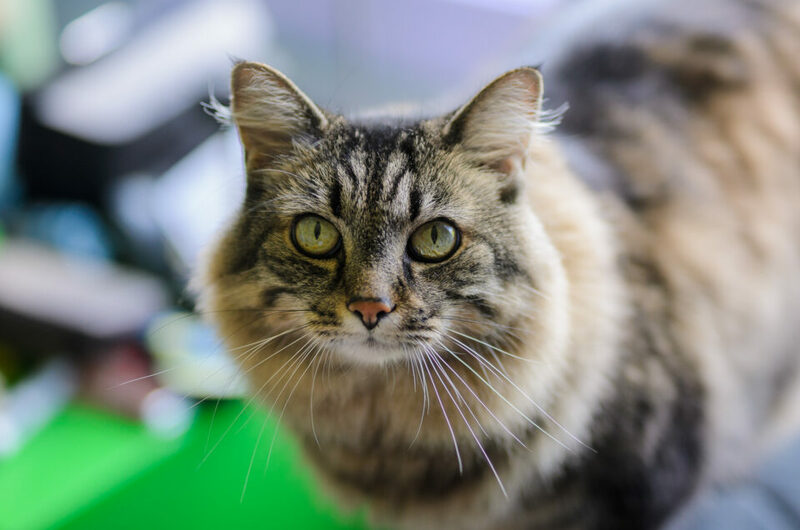 If you have a 50mm f/1.4 lens, the largest aperture you can use is f/1.4. If you have an 18-55mm f/3.5-5.6 lens, it works the same way. At 18mm, the largest aperture you can use is f/3.5. At 55mm, the largest aperture you can use is f/5.6. In between is a gradual shift from one to the other. Photographers generally don’t care as much about the smallest aperture (aka “minimum aperture”) that the lens allows, which is why manufacturers don’t put that information in the name of the lens. However, if it matters to you, you’ll always be able to find this specification on the manufacturer’s website. A lens’s smallest aperture is typically something like f/16, f/22, or f/32. I mentioned earlier that aperture blades are like the pupils in your eyes, and that’s a very useful analogy if you’re still trying to understand things. When it gets dark outside, the tiny muscles in your iris will cause your pupils to dilate (increase in size). This, of course, lets in more light. It’s why we can see things surprisingly well even at night. 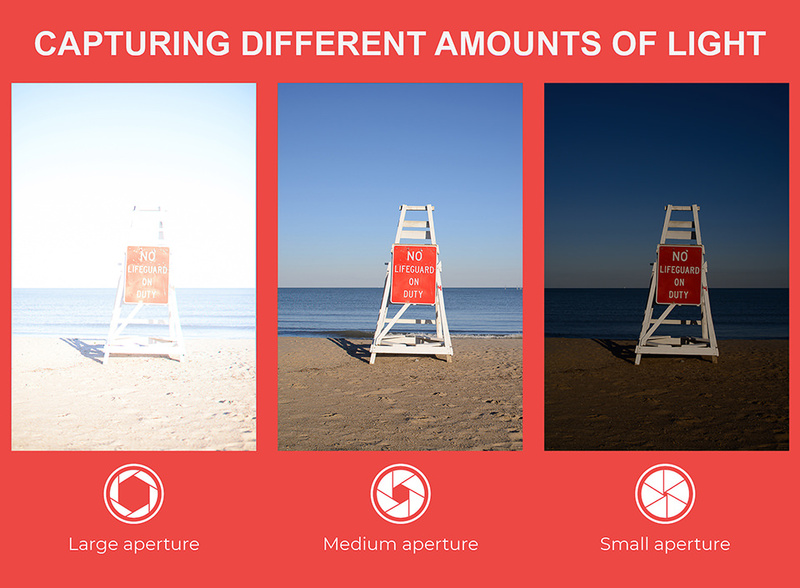 Aperture is exactly the same! A large aperture opening — something like f/2 — will let a ton of light pass through your camera lens and get captured by your sensor. 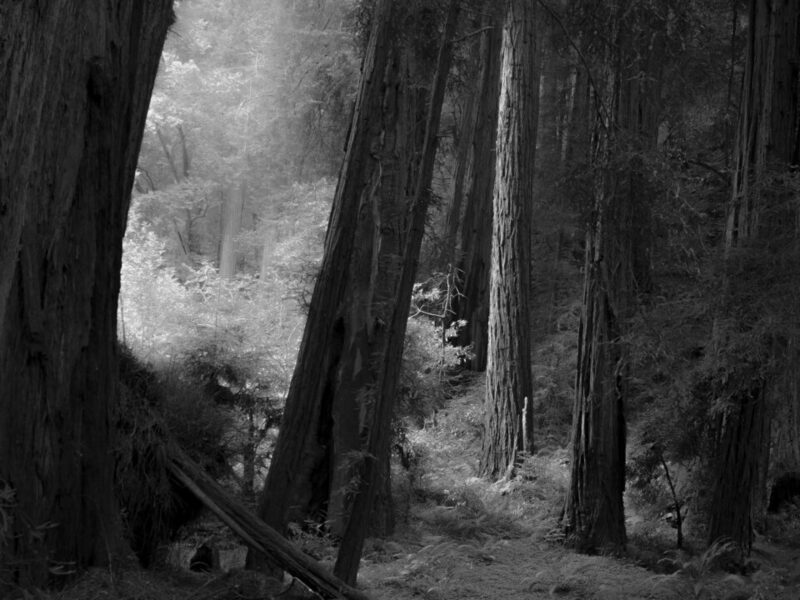 A small aperture opening — something like f/16 — will block most of the light passing through your lens, resulting in a photo that is much darker. Hopefully, you find this diagram helpful. However, there’s one problem: It makes it seem like you should always use an aperture of f/5.6! The more you practice setting the right f-stop in the field, the more intuitive it will become. If you’re just beginning to learn about aperture, it may help to print the diagrams in this section and use them when you’re taking pictures. Along with the amount of light that your aperture allows, it has one other huge effect on your photos: depth of field. This is very interesting! As you can see, in the f/4 photo, only a thin slice of the lizard’s head appears sharp. The background of the photo is very blurry. This is known as depth of field. 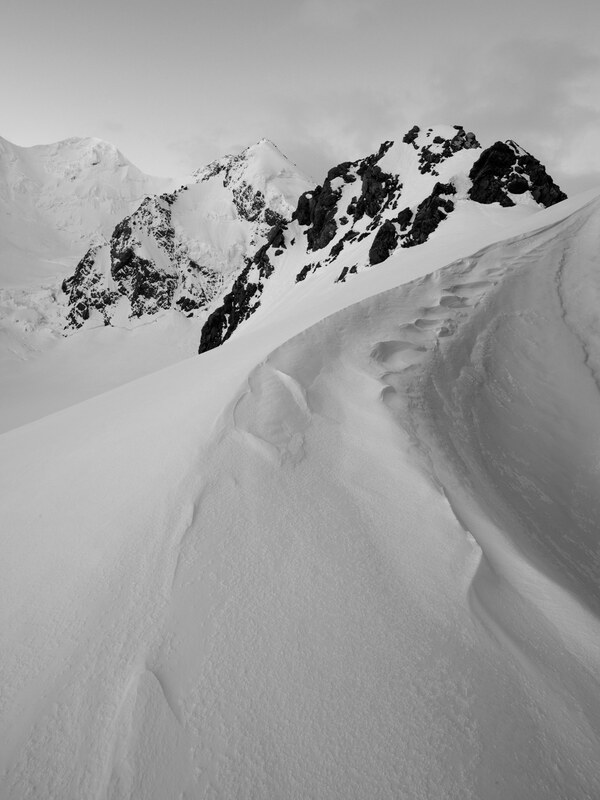 On the flip side, you should be able to see why landscape photographers prefer using f-stops like f/8, f/11, or f/16. If you want your entire photo sharp out to the horizon, this is what you should use. This might not be as exciting as cat photography, but I still like it! You can see how all the ice crystals at the bottom of the frame are completely sharp, and so are the mountains in the distance. That’s only possible because I used a small aperture of f/16. 9) What is the aperture scale? Usually, the sharpest f-stop on a lens will occur somewhere in the middle of this range — f/4, f/5.6, or f/8. However, sharpness isn’t as important as things like depth of field, so don’t be afraid to set other values when you need them. There’s a reason why your lens has so many possible aperture settings. I wrote another article that dives into every single effect of aperture in your photos. It includes things like diffraction, sunstars, lens aberrations, and so on. However, as important as all that is, it’s not what you really need to know — especially at first. Instead, just know that the two biggest reasons to adjust your aperture are to change brightness (exposure) and depth of field. Learn those first. They have have the most obvious impact on your images, and you can always read about the more minor effects later. Aperture is a hole in your lens that lets light pass through. F-stops (aka f-numbers) are the numbers that you’ll actually see on your camera or lens as you adjust the size of your aperture. 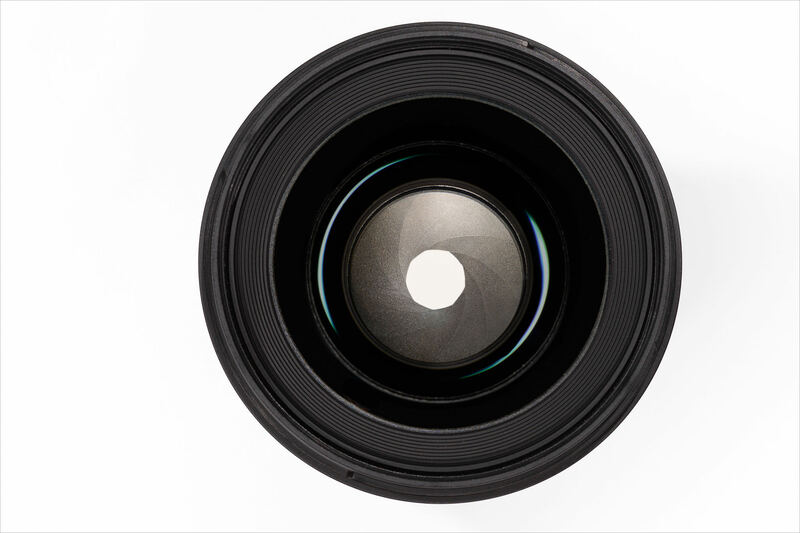 A “small” aperture simply means that the aperture blades in your lens are closed quite a bit. A “large” aperture means that the blades have a very wide opening. Since f-stops are fractions, an aperture of f/2 is much larger than an aperture of f/16. Your lens has a maximum and minimum aperture that you can set. 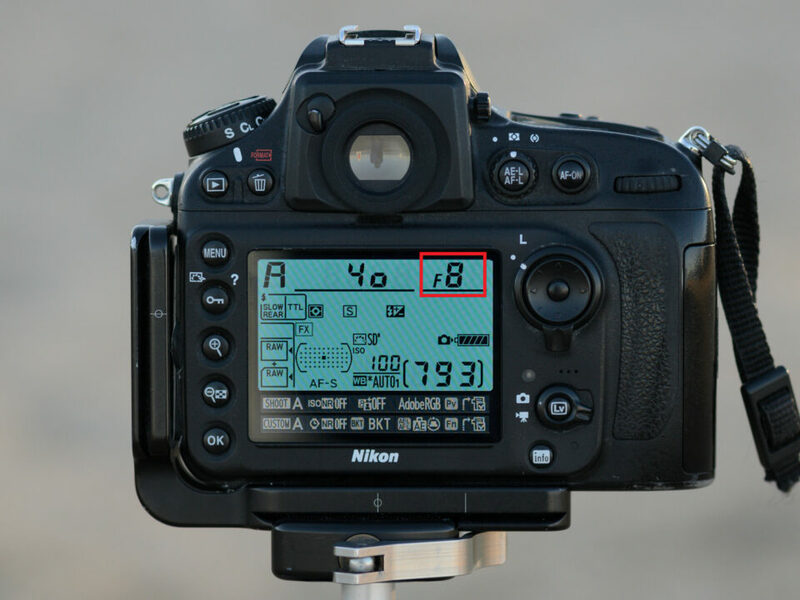 For something like the Nikon 50mm f/1.8G lens, the maximum aperture is f/1.8, and the minimum aperture is f/16. You can’t set anything beyond that range. Just like the pupil in your eye, a large aperture lets in a lot of light. If it’s dark out, and you don’t have a tripod, you’ll want to use a large aperture (something like f/1.8 or f/3.5). 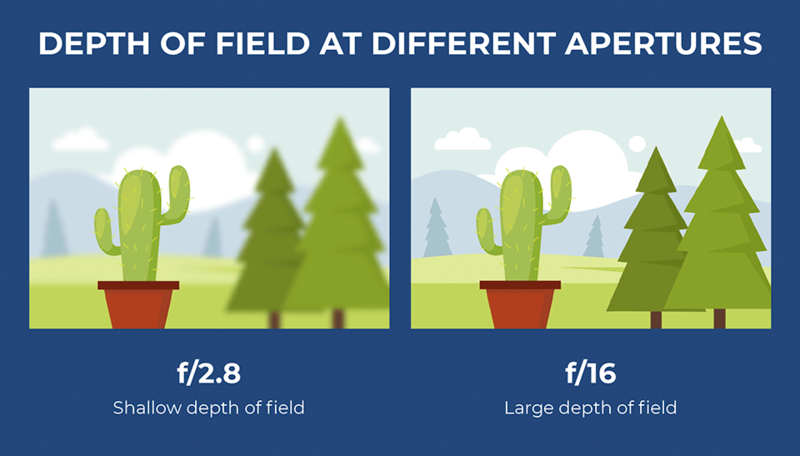 Aperture also affects the depth of field in a photo — how much of the image appears to be in focus. Large apertures like f/1.8 have a very thin depth of field, which is why portrait photographers like them so much. 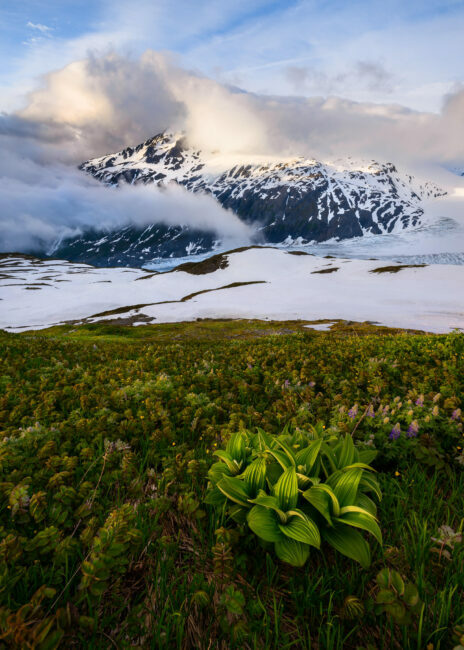 Landscape photographers prefer using smaller apertures, like f/8, f/11, or f/16, to capture both the foreground and background of a scene as sharp as possible at the same time. 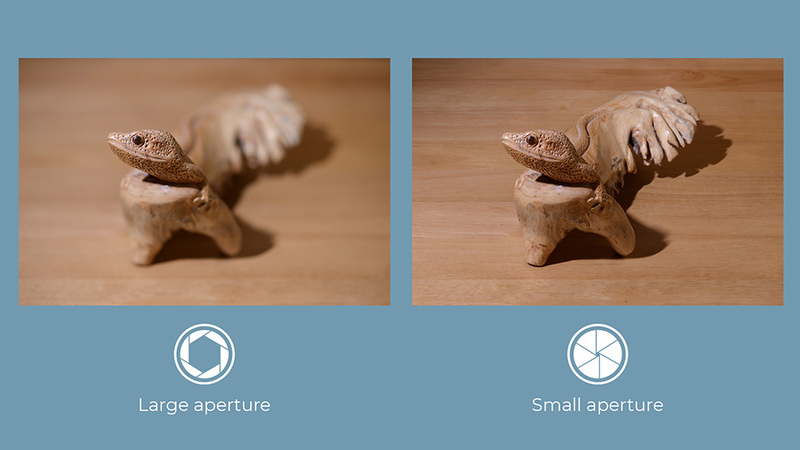 There are other effects of aperture, too, but exposure and depth of field are generally the most important. That’s it! If you understand these seven bullet points, you’ve got the basics of aperture. Of course, putting everything into practice is another matter. Even if this entire article makes sense for now, you’ll still need to take hundreds of photos in the field — or, more likely, thousands — before aperture becomes completely intuitive. Luckily, you have the building blocks. Aperture and f-stop aren’t complicated topics, but they can seem a bit counterintuitive for photographers who are just starting out. Hopefully, this article clarified some of the confusion, and you now have a better understanding of the fundamentals of aperture. Taken at a large aperture of f/2.8, which provides a shallow focus effect. Taken at f/8, a relatively medium aperture value. In this case, since there was no foreground right next to my lens, every part of this image (from front to back) is very sharp. Taken at a small aperture of f/16. Here, my foreground was so close to the lens that I needed a huge depth of field. Thank you Mr Spencer Cox. I am a learner of digital photography and I am a regular reader of Photography Life for last few years. I had Nikon Coolpix P530 as a startup then recently I purchased D3300 with kit lenses. I have read the earlier article on aperture “Understanding Aperture – A Beginners Guide” and other related articles. But even though I couldn’t grasp the essence of aperture fully. But this article with the images, graphic representations and explanations have made me much clear to understand one element of the exposure triangle. I expect similar lucids article on the other two elements of exposure triangle, too. I am also inquisitive about Nikon Picture Control, what is it and how we newbies can get the best from it. I haven’t found any article on this subject in Photography Life. Thank you once again. Very helpful and thorough. Thank you so much. Thank you Spencer! I’m fairly new at trying to be a serious photographer… beyound point and shoot photography that is. I’ve read a number of your articles. As is this article, you present photography in a highly understandable and enjoyable to read manner. I am very grateful to you for sharing your expertise and insights… and your outstanding photographs. Thank you very much! You are quite welcome! Glad you found those illustrations helpful. Sometimes, looking at a sequence of how photos change as you alter a particular setting is the best way to visualize how that setting actually works. Excellent job. Very easy to understand when it is described as above. Extremely helpful for a beginning photographer such as myself! Thank you for taking the time to illustrate the concepts in such a clear and easy to follow manner. Sure thing, I am happy that you found it clear and useful! Thank you for the broad, and yet interesting article on Aperture, and F-Stops. They are one of the most fundamentals of photography, and you make me feel like a pro just by explaining it easily. I have always wondered what those numbers are on the Lenses. Now I know. I will be looking for all your other articles. Thank you again. Thank you for your explanation as I am in the process of trying to internalize this information to take me off of the Auto setting. Am getting better results, but am not “there” yet. Glad you liked it! And best of luck moving beyond Auto. It takes some practice, but the results are absolutely worth the effort. Great way to explain things. Really liked the way the concepts are explained here. after reading this its very clear now. Also I need to do baby photoshoot (as of now indoor and probably outdoor later) can you suggest a lens among Nikon 50mm f/1.8G and 35 mm f/1.8G little confused in choosing Prime lens here. This is an amazing article. I used Google to search “what f-stop means”. This was an article that came up. It is so thorough and easy to learn. I cannot wait to take my first fireworks photos this evening with my Nikon D3400. Thank you again! Thank you for such a great article! I have a question though, would an aperture of f/8 be good enough for landscape photos? Usually, f/8 will be a good aperture for landscape photos. However, if you are using a medium/telephoto lens, or if your foreground is very close to your lens, you may want to use an aperture of f/11 or even f/16 instead. Great article. Everything is very clear and well-explained, right up to the aperture chart – which was presented without a word to the math that underpinned it. I understood that f/1.4 lets in more light that f/2.0, which lets in more light than f/2.8… but those numbers seemed detached from the half/double progression as it relates to focal length and aperture. In other words, what wasn’t clear was why the particular progression (1.4, 2, 2.8, 4, 5.6, etc.) yielded half the light at each step. It was only after I did the math to derive the surface area of the aperture that it became clear to me. Given any focal length lens, the surface area of the aperture roughly halves between the listed f-stops. Half the surface area, half the light. Outstanding article!!! One area I’m hoping to get clarification on is the following statement. “You can think of depth of field as a glass window pane that intersects with your subject. Any part of your photo that intersects with the window glass will be sharp. The thickness of the glass changes depending upon your aperture. At something like f/4, the glass is relatively thin. At something like f/32, the glass is very thick”. How does the aperture setting change the thickness of the glass? This was great info. Just ordered the Pentax K70 with 18/155 and can’t wait to get started. I’ll be looking for more of your helpful info. Thank you. I was looking to buy a new lens for my camera and got confused about the f numbers. Since the more expensive ones had a lower aperture than cheaper ones, I needed an explanation. Your guide hit the spot. Happy that it helped! Yes, lenses with larger maximum aperture values tend to be more expensive, for reasons that hopefully make sense given the context of this article. Best of luck with your new lens. Tremendously informative article. Simple and well-explained for beginners as compared to other articles I was reading which was mostly technical jargon only understandable by professional photographers. Great Job !!!! Hope to read rest of your articles as I progress with photography. Mr. Cox, today I was looking for EV in Aperture Mode, and Photographylife shows up, and you guys keep me reading like crazy. Now I know that my 28-300mm F3.5/5.6 is not as good as I tough, but I am saving money for the 14-24mm f/2.8. I just finished reading your article and thanks for the eye-opening. It’s great to find people who just teach for love to the art. Thanks so much. I appreciate the simplicity since I’m not a math wiz. I’m taking a digital photography class and need to understand the stops from one f-stop to another such as how to determine the f-stop for a given shutter speed. I have been searching for help in figuring out these problems. Perhaps you can help? Sure thing. You can use any shutter speed with any f-stop; one is not tied to another. And there are very good reasons to use different shutter speeds with a given f-stop! 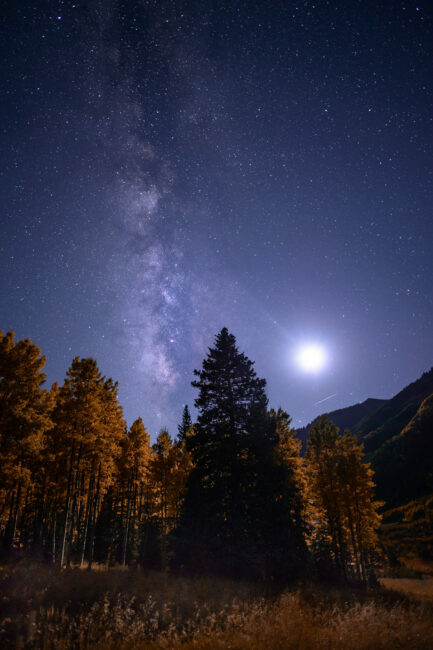 For example, if it is incredibly dark out, I might use an f-stop of f/2.8 to let in a lot of light, and a 30 second shutter speed with a tripod to gather as much light as possible. But in a different case, I might need the shallow focus of f/2.8 in a bright environment, in which case I will use a very fast shutter speed like 1/1000 second in order to keep the photo at a reasonable brightness. If you already know one combination of shutter speed and aperture that work for your image, though, you can immediately figure out all the others as well. For example, if you are provided with an exposure that is ideal at f/8 and 1/30 second, you can go either way with it: f/5.6 and 1/60 second, f/4 and 1/125 second, f/2.8 and 1/250 second. Also f/11 and 1/15 second, f/16 and 1/8 second, and f/22 and 1/4 second. That’s because the aperture scale goes: f/2.8, f/4, f/5.6, f/8, f/11, f/16, f/22 (getting twice as dark each time, and allowing for more apertures than this range alone, depending upon what f-stops your lens lets you set). And the shutter speed scale is much easier, with half the time resulting in half the brightness. So, 1 second, 1/2, 1/4, 1/8, 1/15, 1/30, 1/60, 1/125, 1/250, 1/500, 1/1000, etc. Very informative. As somebody who has always used auto mode, I appreciate the info as I delve into manual settings. Glad you found it useful, Jay, thank you for your comments! You are quite welcome, Decky, I am happy to hear it! Hi Spencer, thanks for such an in depth yet easy to understand article. As a very amateur photographer I liked to think I understood the concepts around aperture settings but this was very informative without the technical jargon. I have difficulty with depth of field and sharpness of some photos I take and can’t work out where the problem is where end up with a ‘soft’ focus. I think it may be shutter speed and a narrow aperture which is limiting the amount of light in some instances. You are quite welcome, Chris! The lack of sharpness could be due to any number of issues, from missed focus to blur from a shutter speed that isn’t fast enough – but some testing to determine under which conditions you do take completely sharp photos should give you good insight as to how to improve it when you don’t. Glad this article could help! Spencer this is an awesome article, thank you for taking the time to put it together. I have one question. What makes the aperture effect the focal length? I understand that it does, and how, but not the why behind it? Hi Simon, glad you liked the article! Just to clarify, aperture does not affect the focal length. The only thing that affects focal length is where you turn the zoom ring, i.e., 24mm, 35mm, 50mm, and so on. Perhaps you meant focal length affecting aperture? In that case, it’s all down to a particular ratio: (focal length / f-number) = physical diameter of entrance pupil. (Entrance pupil is how large the aperture looks, as seen through the front of the lens.) So, with a focal length of 50mm and an aperture of f/5, the diameter of the aperture blades will look 10mm across. This means something important: at a given f-number, a longer focal length requires a larger diameter of the entrance pupil. And the opposite: if the diameter of the entrance pupil stays the same as you zoom in, your f-number increases. You can see this yourself if you have a constant aperture zoom, like a 24-70mm f/2.8. Set the lens to f/2.8 and 24mm. Look through the front of the lens as you zoom in to 70mm. The diameter of the aperture blades will get much larger as you zoom. If you’re asking why it is that a larger diameter at a long focal length is equivalent to a smaller diameter at a short focal length, the answer is a bit more complex. It has to do with gathering total photons of light. 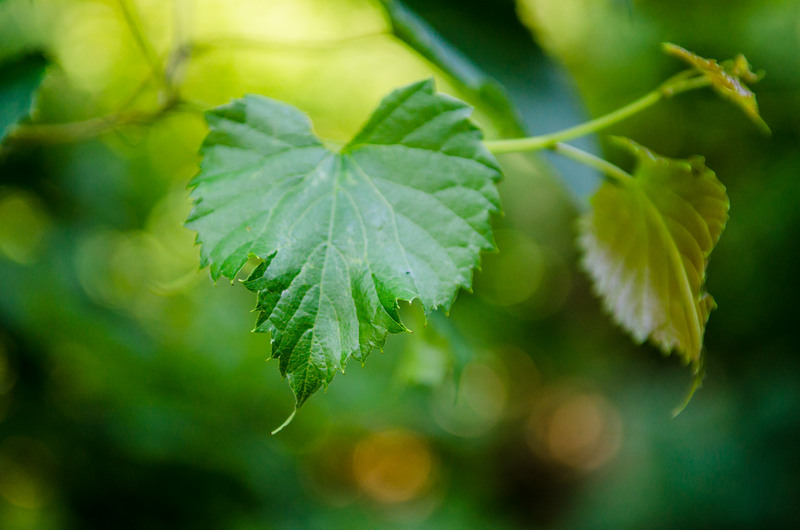 Say that there’s one particular leaf on the ground which reflects 100 photons during the length of your exposure. When you’re zoomed out, those 100 photons may fall on just one pixel in your photo. When you zoom in, those 100 photons would spread out to, say, 4 pixels now. Each pixel gets 25 photons. So, the overall photo appears darker. To gather 100 photons per pixel, now, you would need a larger diameter of your aperture blades. The exact amount larger turns out to follow the equation I just gave you: (focal length / f-number) = physical diameter of entrance pupil. This is just a basic explanation and not very technical, but hopefully it makes sense why zooming in and keeping the aperture blades the same size will result in a darker photo. Hey Spencer Cox you are a god. I some times wonder if people do not really want the novice to understand . I will now be off to Norwich cathedral in the morning armed with my Canon 80D attached to my 18-300 lens with far more understanding of what to do thanks to this superb article . Looking at my best photos, I’ve realised that I’m very into macro or landscape…not the best combo when trying to buy a lens ah! I’ve been researching for about the past 3 months and reading reviews and dear lord I get more and very frazzled so I need help. I know it’s basically impossible to find a lens that would cover both genres of photography but can you recommend anything to me that would help? My budget would probably be up to £1000? Hi Amber, I’m sorry that I just saw this comment, but maybe I can still be of use. I think I was in a very similar boat as you when starting out photography – a student on a budget, mainly interested in landscapes and macro photography. If your budget is £1000, I would suggest two lenses rather than one. Macro lenses are actually great for landscape photography, but you might enjoy having a wider lens for your D3300 as well. For the wide-angle lens, I would suggest the Nikon 10-20 f/4.5-5.6 AF-P DX, which sells for £264 – or the Tokina 11-16mm f/2.8 II, which sells for £479 (I found these prices on Amazon UK, but you might be able to find better deals, especially used or refurbished – how I bought all my lenses as a student). The two lenses are similar in image quality; I would get the Tokina if you plan to do Milky Way photography, because of the f/2.8 aperture, but otherwise would lean toward the Nikon. For the macro lens, it is best to get something at least 85mm or longer. It will give you more working distance, making it easier to light your subjects, and also just extend your kit lens reach by as much as possible. I love telephotos for landscape photography, too, so there is definitely a dual purpose here. Make sure to get a lens with a built-in focus motor, since the D3300 doesn’t have one, and you won’t have autofocus otherwise. To me, the best choice here is the Sigma 105mm f/2.8 HSM Macro lens, which has a built-in motor and is not very expensive at £329 new. It even has full-frame compatibility if you happen to get an FX camera in the future, and is a very well-regarded lens. Best of luck, and if you have already made a decision, I hope things are going well! There are very few bad options out there, so it’s hard to go wrong. Fantastic article! Wish I would have found this before I bought a book on the topic. Will bookmark this page for future reference. I’m happy you found the article so useful, James! Aperture is not the easiest subject to master, but it is so critical to photography that it’s worth taking the time to learn. It sounds like you are making a lot of progress in that respect. Love this article, learned so much from it! You break it all down so it’s easier to understand. Thank you.